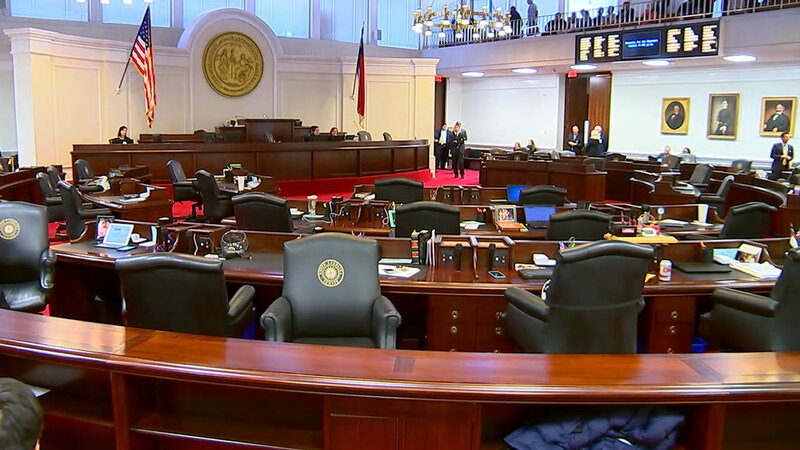 RALEIGH, NC -- North Carolina's highest court stepped in Friday to limit the Republican-dominated legislature's efforts to minimize Democratic Gov. Roy Cooper's ability to pursue his goals, declaring unconstitutional a law devising a state elections board that hinted at deadlock. The state Supreme Court ruled 4-3 that Cooper couldn't be forced to pick a politically divided, eight-member elections board from names the two major political parties selected. The law prevented Cooper from removing members with whom he disagreed unless there was wrongdoing. The law makes Cooper unable to fulfill his duties to ensure election laws are followed because half of the elections board will be people who will probably oppose the governor's policy preferences, the majority opinion said. It's the first of what may be several times the high court steps in to referee the ongoing political battle in state government. The GOP-led legislature started changing laws on who organizes and manages elections soon after Cooper narrowly beat incumbent Republican Gov. Pat McCrory in 2016.
Cooper's sued over a law that converted the elections board from majority Democrat to equal numbers of Republicans and Democrats, and requiring five members to support any decision. The elections board has had a majority of members from the governor's political party for a century. The law also prevented the state's top elections executive, who originally took the job under the old majority-Republican state board, from being removed from her job for years. It also directed a Republican to be the chairman of the new elections board in presidential election years, when national and statewide contests generate the most voter interest. Cooper didn't dispute the General Assembly's authority to reshape government, in this case merging the state Board of Elections with the Ethics Commission, the court said. Instead, Cooper challenged how the new panel was constituted and required to operate, the court said. Legislative leaders had argued that neither the governor nor state courts could challenge their decision. But the court said its decision was in line with an earlier ruling in McCrory's favor that the General Assembly had exerted excessive control over certain government agencies. The problem was that the law required Cooper to pick half of the members from a pool of the opposing party's recommendations, the court ruled. "The relevant issue in a separation-of-powers dispute is whether, based upon a case-by-case analysis of the extent to which the governor is entitled to appoint, supervise, and remove the relevant executive officials, the challenged legislation impermissibly interferes with the governor's ability to execute the laws in any manner," Justice Sam J. Ervin IV wrote for the majority. Cooper said the law would have given Republicans leverage to discourage voting or create deadlocks on the board. "I appreciate the court's careful consideration," he said in a statement. "Access to the ballot box is vital to our democratic process and I will continue to protect fair elections and the right of North Carolinians to vote." Backing Ervin's decision were the other three registered Democrats on the court. The three registered Republicans joined in two dissenting opinions. In one, Chief Justice Mark Martin wrote that Cooper had enough control over the combined board. The majority opinion defends "a partisan makeup of the (board), which threatens to inject political gamesmanship into the implementation of our election and ethics laws and undermines the neutrality inherent in an evenly divided bipartisan composition," Martin wrote. Senate leader Phil Berger, one of the lawsuit defendants, called the outcome a "breathtakingly partisan decision by the Democrats on the Supreme Court," and tweeted excerpts of dissents by Martin and Justice Paul Newby.